To the list of artists. Sharon Ya’ari is known for his large, staged photographs that portray the Israeli landscape. 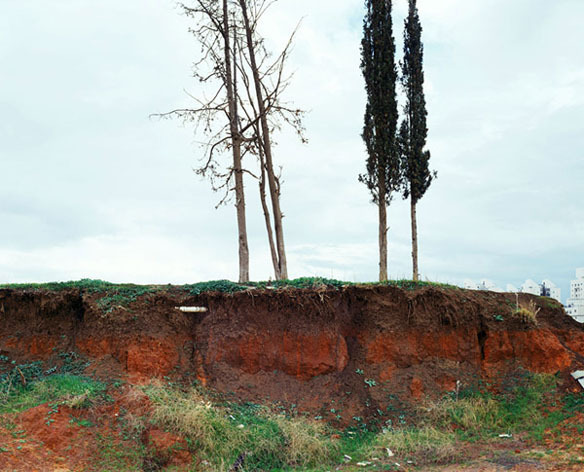 Unlike many images in this exhibition, which are grounded in a specifically Israeli context, Ya’ari's photographs lack identifying information and depict seemingly unremarkable locations. In "Cypresses", the trees in a battered landscape are invested with an enigmatic aura that suggests the religious traditions of the region. Traditionally an inspiration to Jewish and Israeli artists, cypresses were the trees that according to the Bible were used to build Noah's ark as well as the First Temple. The four trees standing in proud isolation in Ya’ari's photograph are in fact remnants of rows of cypresses used as wind protectors of orchards, and the exposed pipe in the foreground attests to the threat to the environment posed by commercial development.